After the article was published, I noticed a couple of errors. Since, unlike with XE.com, at Seeking Alpha I can't go back and revise the article itself, I corrected in a comment, which I'm repeating below. I expect the kinks required by my tight publication schedule there to get worked out in short order. In the meantime, sorry for the errors. 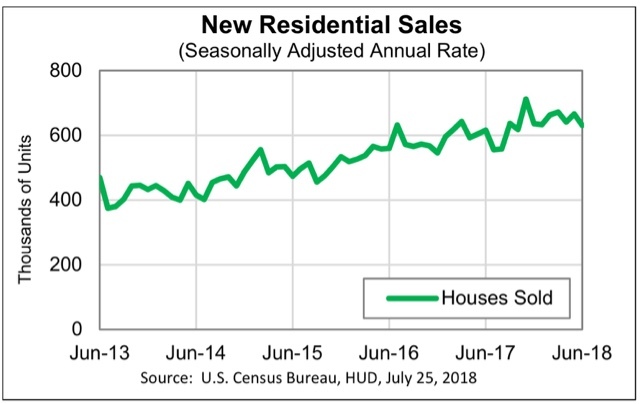 Data for June included new and existing home sales, which both declined. Durable goods orders rose. Consumer confidence as measured by the University of Michigan rose slightly, although the longer term trend in the leading "expectations" component has been generally flat for 18 months. In the rear view mirror, Q2 GDP as expected came in quite strong, at +4.1%, although exports contributed roughly +0.5% more than usual to that number. The long leading indicator of proprietors income increased, but that of private fixed residential investment as a share of GDP declined. Second, in the conclusion I accidentally wrote that mortgage rates were a positive. As I note in the body of the article, having risen back above 4.65%, they are a negative, which is what I factored into my long term forecast of neutral. It's worth noting, though, that had the yield curve been only 0.5% tighter, the only remaining positive would be the credit indexes, and that would be enough to have tipped the long term forecast to negative. This morning's preliminary reading of Q2 2018 GDP at +4.1% was generally in line with forecasts. The coincident data, as I've reported in my "Weekly Indicators" column, as well as things like industrial production, the regional Fed reports, and real retail sales, have all been very positive for the past few months. So, "hurrah!" for the growth of one to four months ago. One point widely notied, which I'll also repeat: exports added about 0.5% more than usual to the GDP number. This was almost certainly producers trying to get ahead of Trump's trade wars, and will likely subtract an equivalent percentage over the next quarter or two. In other words, GDP ex-frontrunning the trade war was about 3.6% annualized. But will it last? As usual, my attention is focused not on where we *are*, or more properly, recently *were*, than where we *will be* in the months and quarters ahead. According to Prof. Edward Leamer, this typically peaks about 7 quarters before the onset of a recession. As it has not made a new high since five quarters ago, and must be considered a signficant leading indicator of recession at this point, although it is only down about half the percentage from its peak as the least amount prior to a recession (-3% vs. -6% before 2001). In short: one long leading indicator declined, the other rose. Obivously that wasn't true for the second quarter, although YoY growth remains only +2.9%. To reiterate what I said three months ago in response to Q1 GDP, while the economy is very likely to continue to grow through 2018, together this most recent data suggests a more questionable picture heading in 2019. There is nothing in this morning's strong Q2 GDP that causes me to change that view. All of the long leading indicators with the possible exception of corporate profits (for which proprietors' income is a less reliable proxy) have continued to weaken, and there has been accumulating evidence in the monthly and even weekly reports that the important component of housing is at best very weakly positive and may even have tipped over to negative. For the last decade I have made a specialty of observing "long leading indicators" -- those metrics that turn at least a year before the economy as a whole does -- and of historical indicators that date as far back as the 1910s. That specialty is particularly relevant in discussing the current obsession with the shape of the yield curve, slicing and dicing the modern data as it relates to the Fed funds rate, 3 and 6 month Treasuries, 2 year Treasuries, 10 year Treasuries, and the inflation rate. Why? Because historically a yield curve inversion is not a necessary precursor to a recession. To begin with, the Fed did not begin making use of the Fed funds rate until 1954. The Fed itself didn't exist until 1914, and for the first 40 years of its existence only made use of the discount rate, which itself was not made uniform nationwide until 1935. With the exception of the "great contraction" of 1929-32, the yield curve measured this way never inverted before 1959. That's *5* recessions which waiting for a yield curve inversion would have missed. Again, no inversions whatsoever between 1929 and 1959, although it did come close, but did not invert, prior to the 1927 and 1957 recessions. There are problems both ways with this argument. On the one hand, the Fed funds rate exceeded the inflation rate for most of the 1920s, 1960s, 1980s, and 1990s -- in short, the most prosperous decades during the last century! On the other hand, the Fed funds rate did *not* exceed the inflation rate prior to the 1918, 1920, and 1949 recessions -- and was moving the "wrong way" prior to the 1957 recession! In short, once we go back before 1960 -- i.e., a low interest rate environment very similar to the one we have been in for the last decade -- although a yield curve inversions is very bad (1929! ), neither an inversion nor a "tight" real Fed funds or discount rate is necessary at all for a recession to occur. While it is far too long to get into here, here are several other historical graphs to consider. The archival annual housing starts series turned negative during the year in which recessions began 11 out of 14 times. The archival monthly series turned negative before all 4 post-WW2 recessions leading up to and including 1960. A detailed historical consideration of housing is far too long for this post. But consider that the common thread, going back almost 150 years, appears to be that something happens in the economy to cause consumers to pull back on their purchases of important durable goods like houses, of which the Fed raising interest rates (and inverting the yield curve) may only be one cause. A tantalizing question about existing home sales: have they peaked? I normally don't pay that much attention to existing home sales, even though they are about 90% of the overall market. That's because their economic impact is not nearly so important as new home sales, because of all of the construction costs and purchases made by the new homeowners over the next year or two. 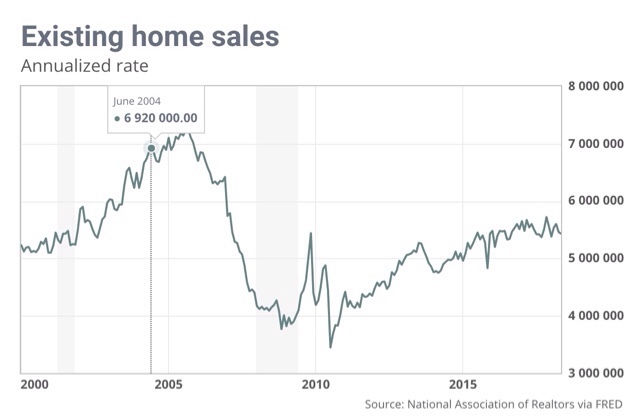 But let's take a look, at least partly because existing home sales *may* -- and it's a very big "may" -- be in the midst of a turning point. The overall picture in the report is same old, same old: sales flat, prices up over 5% YoY, inventory still depressed. I do not envy at all buyers in this market, where the average house sells in a mere 27 days! I discount the "months' inventory" metric, because historically it has turned because sales turn, and not because of a meaningful change in inventory. Note that sales turned flat at roughly 5.50 units in summer 2015, and have hovered near that mark +/- 5% since. See that peak in November? We'll come back to that. The median new house used to sell at a 10% premium. Since the great Recession, that has blown out to 30%. The price of the median existing home has continued to rise strongly, up to $276,900 in June. June's inventory, reported this morning, was 1.95 million units. That is the first YoY increase since 2014. Inventory made a temporary bottom in 2012, but then has continued to fall -- until now? In the meantime, let's hypothesize that maybe sales peaked in November 2016. Prices are continuing to rise. 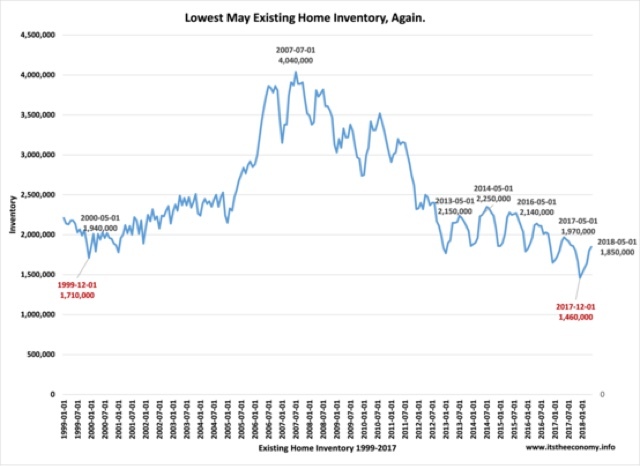 We would expect to see that inventory will continue to rise. In other words, it's at least possible that we have reached the point, with existing homes, where increased interest rates and price increases that exceed income growth, have caused the cycle to turn. The much more economically important new home sales will be reported in two days. 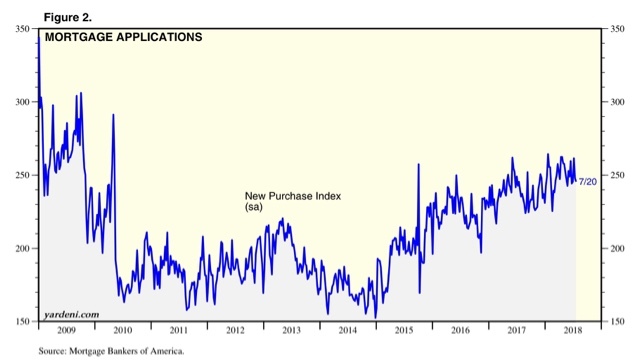 This metric, along with purchase mortgage applications, has been the most positive of all housing measures for the past few years. 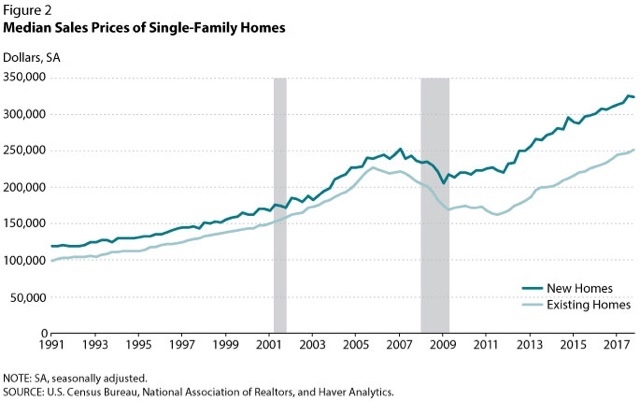 The less volatile single family permits have not made a new peak in four months. Will new home sales continue to defy gravity, or will they too show signs of stress? We'll see. That the President of the United States is a Russian asset needs to be openly acknowledged. He may be a naive, negligent or unwitting asset, a coerced asset, or a willing and enthusiastic asset, or some combination thereof, but at this point there is no getting around that he is a Russian asset. My readers who have followed me from progressive blogs presumably have no trouble accepting this. 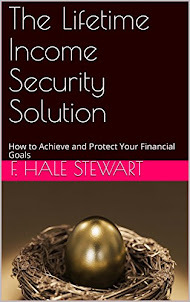 But I know that I also have many readers from investment or economic sources, many of whom are probably Republicans. To them I ask two simple questions: (1) in what way has he acted in any way inconsistent with being a Russian asset? and (2) if you evaluated him the same way you evaluated SEC and other filings in order to determine whether or not to purchase a stock, to what conclusion would you come? What possible reason could there be for a President of the United States to insist on meeting the Russian President both without any witnesses in the room, and also no means to verify what was discussed? Why would a President who is known for bombastically unloading on just about everybody else on the planet, refuse to utter, over a period lasting years, a single negative word about one singular matter: the conduct of the Russian state? In the past week I have only heard three potential arguments against the fact posited by the title of this post. The fact that he concealed it all from his staff (nobody else in the meeting, etc.) [could just] mean ... [that] it was Putin's idea: let's be alone "so we can really talk" (with some nods to the dangers of "Fake News"). But this just means that the President is a naive or negligent asset, in so deep over his head that he does not know he is being played. The second, from Al Jazeera, says that "Trump is not Putin's Puppet," postulating that he has parted company with Russian policy when there is profit to be made. But that implies that he has been both willingly and knowingly abetting Russian policy when there *is* profit to be made. And that, by further implication, suggests that he has already done so in his pre-Presidential career, which of course supports the theory that he engaged in money laundering for the Russian mafia, which is coercive both as a subject of blackmail and also as a threat of violence against his family members. The third is that, in terms reminiscent of Hitchhiker's Guide to the Galaxy, that no asset would be that obvious. Well, a useful idiot certainly would be. In short, I do not see how any person, discerningly sifting the evidence, could not come to the conclusion that the President of the United States is a Russian asset. We need to face that fact openly and publicly.